The Saas valley, found just to the east of the Zermatt valley, is also accessed from Visp. 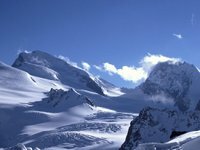 Like Zermatt, it offers spectacular mountain scenery, boasting fourteen 4000 metre peaks like Taschhorn, Allalinhorn, Weissmies and Lagginhorn. They are best seen from the 3,500-metre Allalin viewing platform, which is also home to the world's highest revolving restaurant. 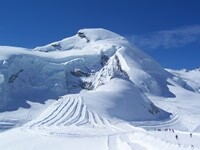 Saas also offers 145 kilometres of pistes, and is an ideal destination for novice and intermediate skiers. Its high altitude means that it has excellent snow quality until late into the season. Many prefer Saas to its more famous neighbour Zermatt: it is less developed and so offers a cheaper and less crowded experience. At 3,500 metres, the Allalin viewing platform offers stupendous views over the nearby mountains and the world's highest revolving restaurant. The nearby peaks include the Strahlhorn (3920 m), Allalinhorn (4027 m), Alphubel (4206 m), Taschhorn (4491 m) and Dom (3928 m), together with the more distant Bernese Alps (and mountains such as the Jungfrau, Eiger and Monch), Italian Alps, and Lakes Maggiore and Orta. Allalin is reached by taking a cablecar from Saas Fee to Felskinn (3000 metres) and then the world’s highest subterranean funicular railway, the Metro Alpin, to a height of 3,500 metres. The Allalin also offers the world’s highest revolving restaurant, the Restaurant Threesixty (with a capacity of over 500, serving hearty mountain fare), and is the starting point for an ascent of the Allalinhorn (4027 metres), graded F (facile or easy), two hours from the funicular (local mountain guides can be hired for a reasonable fee). Other attractions include a monument to mountain guides, the largest ice grotto in the world (70 metres long, carved out of a glacier, with plenty of interesting ice sculptures and information), and the nearby Langflub and Morenia ski areas (which are open in summer and often host national ski teams). Finally, Allalin is also the starting point for the world's longest downhill ski race, one of the four Super Vier events (the 9 kilometre piste includes 1800 metres of descent, with skiers reaching 140 kilometres per hour). The April 2015 race attracted over 1000 competitors. This year the race will take place on 8-9 April 2016. 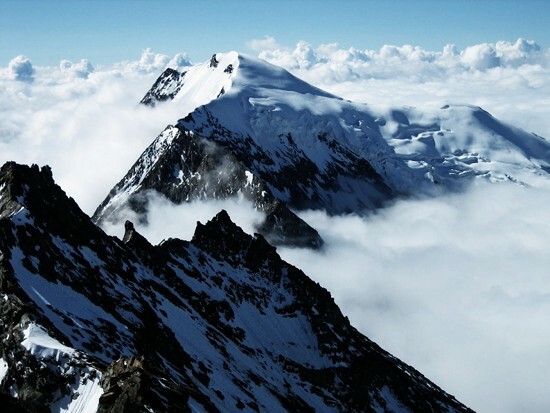 Two of the lesser known Alpine gems—the Weissmies and Lagginhorn—are climbed from Saas. At 4027 metres, the Weissmies is the grander of the two mountains, with a snow-domed summit leading down to the Triftgletscher (Trift Glacier). The usual ascent, crossing the glacier and ascending the snow slopes, is graded PD (ie the middle of the peu difficile category), and involves 3-4 hours ascent from Hohsaas on snow or ice to 40 degrees with some exposure (descent should be much quicker). The view from the top is spectacular. Dangers include crevasses, seracs and cornices. For those looking for more of a challenge, the north ridge, graded D (ie difficile) takes about 6 hours to ascend and 2 hours in descent. 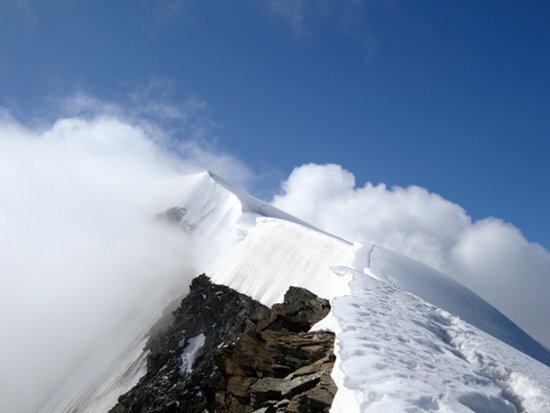 The 4010 metre Lagginhorn is predominantly an easy scramble and rock-climb, with some glacier travel at the outset. It is also graded PD, with the ascent taking 3-4 hours from Hohsaas (descent 2-3 hours). There are the usual glacier dangers, together with a risk of rock fall and loose stone. The open panorama from the summit makes the effort worthwhile. A more difficult, AD route, is the south ridge, a relentless 4-hour climb from the Lagginjoch (3499 metres), itself 1 hour from Hohsaas. Another objective is the less-famous snow-capped 3996-metre Fletschhorn, found to the north of the Lagginhorn. where? 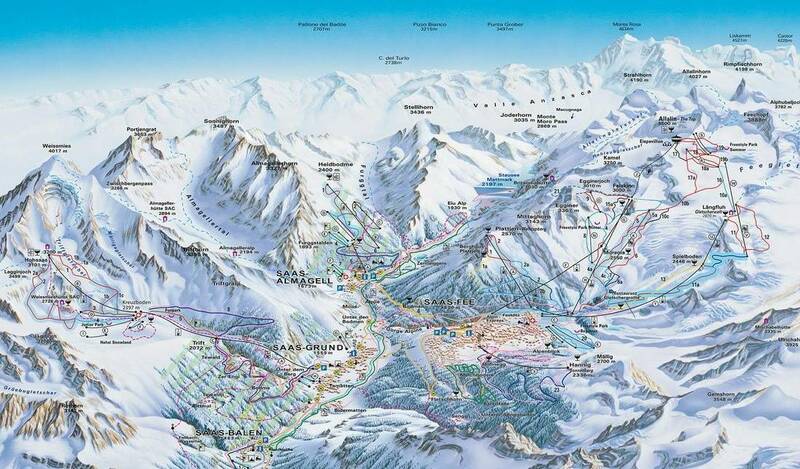 Take the cablecar from Saas-Grund to Kreuzboden (2397 metres) and then on to Hohsaas (3200 metres). You will see the Hohsaas mountain hut and restaurant to your right hand side; this hut offers reasonable food and good accommodation, allowing an early start for the Weissmies or Lagginhorn. £$€¥ Half board at the Hohsaas Hut costs CHF81 per night. Built by the British Members of the Swiss Alpine Club (SAC) in 1912, the Britannia Hut (3030 metres) is now the SAC’s most popular mountain hut. Sleeping 134, the Hut has three dining rooms and modern washrooms, using solar energy and rain and meltwater. It offers great views to the Allalinhorn, Strahlhorn and Weissmiss groups of mountains in the foreground and the Bernese Alps in the distance. The Hut is the beginning of the popular Haute Route from Saas-Fee to Chamonix (the ‘High’ or ‘Mountaineer’s route, with a distance of 180 kilometres, undertaken on foot or on ski). It is also an excellent hiking destination, being a one-hour walk on the Fee Glacier from Felskinn (2989 metres), itself accessible by cablecar from the valley, or longer five hour walk from he Plattjen cablecar station (2570 metres). £$€¥ Half board in the dormitories costs CHF75 per night. Drinks and meals are available from 7am to 7pm at reasonable prices. The Saas Valley is a very popular ski resort. Seen as a less pretentious alternative to Zermatt, the valley boasts excellent snow quality late into the season on account of its height (between 1800 and 3500 metres) and stupendous views of the 14 surrounding 4000 metre peaks. The valley has 145 kilometres of piste, made up of 20 blue runs, 19 red runs and 6 black runs, and a longest run of 9 kilometres. In addition, there are 36 lifts (and no long queues), 125 snow cannons, 15 mountain restaurants and 48 kilometres of cross-country trails. Well over half of the routes are in Saas Fee, with a number of black and red runs descending from the valley's highest point—the 3500 metre Allalin. But the nearby slopes of Saas-Almagell (seven blue and red runs descending from Haldbodme, 2400 metres, to the village, 1673 metres) and Saas-Grund (eight blue and red runs descending from Hohsaas, 3103 metres) are not to be overlooked, especially if you are spending some time in the Valley. Lift passes cover the entire valley (Saas-Fee, Saas-Grund, Saas-Almagell, Saas-Balen), with an adult 6-day pass costing CHF365 (Feb 2016). On the downside, there is limited terrain for advanced skiers and the surrounding mountains mean that much of the valley is shaded and cold. 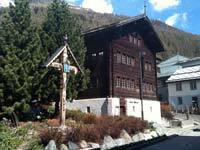 The Saaser Museum is housed in Saas Fee's former rectory, a four-storey typical Valasian building constructed in 1732 and expanded in the mid-19th century. a number of photographs and paintings of Saas, its surrounding mountains, and the people who have lived here over the years. Some visitors comment that only some of the information accompanying the Saaser Museum's exhibits is translated into English. when? Winter: 10-11.30am, 2-5pm; closed on Mondays. Summer: 10-11.30 am, 1.30-5.30pm; closed on Mondays except in July and August. £$€¥ Adults: CHF5; Children: CHF2.50.